Meigs freshman Mallory Hawley (14) hits the ball over the net, during the Lady Marauders’ home match against Nelsonville-York on Sept. 25 in Rocksprings, Ohio. NELSONVILLE, Ohio — The third time apparently wasn’t the charm. 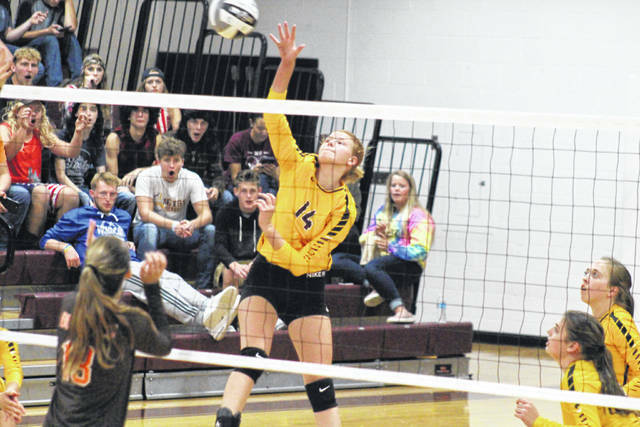 The Meigs volleyball team — which dropped a pair of four-game matches to Nelsonville-York in the regular season — was ousted from the Division III sectional semifinal by the same Lady Buckeyes on Tuesday at Ben Wagner Gymnasium in Athens County, falling by a 3-1 count yet again. The Lady Marauders (4-17) — the 11th-seeded team in the tournament — dropped the first five points of the opening set and never recovered, eventually falling by a 25-15 count. The Lady Buckeyes (12-11) — seeded No. 6 — also scored the first five points of the second game and never trailed on their way to 25-15 victory. Meigs took its first lead of the night early in the third game and stretched it to seven points, at 10-3. NYHS fought back to within two points, at 13-11, but the Lady Marauders earned nine straight and wound up winning the third by a 25-16 tally. The Maroon and Gold never led in the finale, as their season came to an end with a 25-16 Game 4 setback. Meigs’ service attack was led by Marissa Noble with three aces, followed by Breanna Zirkle and Maddie Fields with two aces apiece. Maci Hood led MHS at the net with 10 kills, followed by Mallory Hawley with eight. Noble contributed four kills, Hannah Durst added two, while Fields had a team-best 20 assists. For the Lady Buckeyes, Audrey Bohyer had a team-best five aces, Mackenzie Hurd and Kyla Henderson added four aces apiece, while Madison Booth earned three aces. Mackenzie Hurd had a team-best 10 kills, followed by Henderson with nine. Bohyer posted seven kills for the victors, Haley Hurd added six, while Brittlyn Call came up with five kills. Madi Campbell finished with a match-high 22 assists in the win. This marks the final game in the Maroon and Gold for MHS seniors Maddie Fields, Chloe White and Marissa Noble. The Lady Buckeyes advance to Saturday afternoon’s sectional final at Southeastern. The third-seeded Lady Panthers topped Oak Hill in the opening round of the tournament on Tuesday.